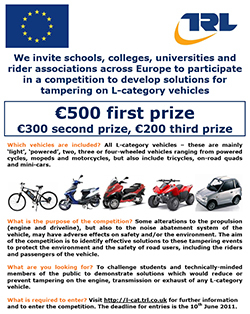 The competition is part of an overall anti-tampering study to identify undesirable vehicle modifications and is open to technically-minded members of the public, schools, colleges, universities, students and riders associations across Europe to propose innovative ideas to reduce or prevent the tampering of L-category vehicles. However a deathly hush has fallen over the rest of the world of motorcycling lobbying – riders’ representatives and even the motorcycle industry, indeed if you listen you may hear a pin drop. There has been no comments, no reports, no indignation not even any support for the competition. If one was a conspiracy theorist, one could think that Right To Ride EU had been set up to report on the competition to face the wrath of riders who are being asked to come up with solutions to prevent them modifying their own motorcycles and scooters – but that’s a ludicrous thought! While everybody appears to be hiding under their rock, our friends at Back Roads Rider have stepped up on the rock and as ever in their style of short concise and sometimes controversial articles designed to invite comment and debate have given an opinion. Another interesting episode in the soap opera of European Union (EU) motorcycle legislation. Yes folks its EU Framework Regulation on motorcycle anti-tampering modification measures, emissions and noise checks time again. The interesting twist here is that when the Commission embarked on its anti tampering journey it failed to grasp what the difference between harmless and harmful tampering was. Oh dear cried the Commission will Mrs Biker bolting on a Petrosneezeich exhaust system be as harmful as Mr Biker attaching a Borbin Cosy Seat, we need to know. Enter the UK Transport Research Laboratory aka TRL who won a contact from the Commission in December 2010 to find out what is and what is not harmless or harmful bike mods wise. So with mucho stakeholder consultation, input from type-approval and enforcement authorities, internet and literature study and experimental testing eventually TRL will come up with a list of the most and least harmful modifications. Thus allowing the Commission to draft crafty legislation requiring the motorcycle and scooter manufactures to produce products that cannot be modified in the most harmful ways, i.e. make it go faster, produce throat gagging pollution and sound like a Lancaster bomber taking off on full chat. Interesting twist number two. Hold the thought that the Commission currently does not know “officially” exactly what is and what is not a harmful or come to that a harmless motorcycle modification. It seems surprising then that the Commission, assisted by TRL, has announced that it is holding a competition to develop solutions for tampering prevention measures on motorcycles and scooters. Yes in a bizarre, even dadaesque, move the Commission is asking schools, colleges, universities and rider associations across Europe to participate in a competition to develop solutions for tampering on motorcycles and scooters. The aim of the competition is to: “identify effective solutions to tampering events to protect the environment and the safety of road users, including the riders and passengers”. Get It? For a 500 Euro prize we are being asked to come up with solutions to prevent ourselves modifying our motorcycles and scooters. Not only that but as the Commission does not know what, if any, modifications are harmful we seem to have a case of the cart being put firmly before the horse. Here’s an idea to prevent dangerous tampering to all vehicles. Just have regional MoT Flying Squads (like the old TV detector vans) who appear in towns/cities/ motorway services in their well liveried vans and perform MoTs on random vehicles. Any that fail the test have to pay for it and get it sorted in the normal way. Those that pass are free to carry on their way. There’ll soon be a move away from illegal ‘modifications’ among the (mainly car driving) motoring fraternity. Might catch a few MoT dodgers too. Q: If I can not modify it and “tamper” with it what happens? A: You will be able to modify your bike – the anti-tampering proposals have not been decided upon and won’t make any difference to normal modifications which most people already do and will be able to continue to do and in any case it refers to new bikes after 2017. Q: What happens to these millions of bikes, etc. that need repair and servicing? A: They will continue to need repair and servicing, you will be able to continue to repair and service your motorcycle. Q:Will they have to be scrapped? Q: Will the EU pay for the repairs and servicing? A: No, because you will be able to continue to repair and service your motorcycle. Q: What happens to individualism? A: Not a lot continue as before. Q: Will the millions of Harley Davidsons have to be scrapped? Q: Will I get compensation for all the tools that I have bought to “do it myself” because I enjoy tinkering? A: No because you will be able to continue modifying and tinkering with your bike as these proposals are not retrospective and therefore any motorcycle before the entrance into legislation of these proposed regulations will not be included. I have only just come across this new proposed “EU legislation” and am disgusted. I am 60 years old and have not ridden a motorcycle or scooter for 40 years but when I retire I fully intend to restore at least one old and beloved motorcycle. If I can not modify it and “tamper” with it what happens? What happens to these millions of bikes, etc. that need repair and servicing? Will they have to be scrapped? Will the EU pay for the repairs and servicing? Will the millions of Harley Davidsons have to be scrapped? Will I get compensation for all the tools that I have bought to “do it myself” because I enjoy tinkering? I think the EU is going too far. Who voted for them anyway? We voted for the “Common Market” not an overbearing, over expensive, wasteful load of foreign bureaucrats with their noses in the trough telling us what we should and should not do. Perhaps we should follow France’s example and totally ignore the laws, rules and regulations that we do not like. Ok peeps has anybody noticed that the electoral slips are dropping through the doors again. When they (Politians) start their little campagns again front them out, they lie anyway, but it will make people think. Also somebody with a bit of Government knowledge needs to start one of these so called online pettions. The Government loves Facebook but hates publicity of the wrong kind! Boris is good for putting his foot in it so, I suggest a MAG rep or similar asks a public question somewhere like the London Assembly a bit of TV footage on the london news channels should start the ball rolling. What about a biking MP or Peer asking a question in Parliment that should let the cat out of the bag especially if they ask if this legislation will be applied evenly to Cars, Vans and HGV’s a like to keep it even and fair to all. That should get the TAXI’s , Haulage Association, and car parts manufacturing industry up in arms. JOBS are under threat aswell as our hobby / way of life, its victimisation by stealth. Being an ex despatch rider louder exhausts keep lemming pedestrians safer. So we keep down the road deaths / casualties by default. Checking statistics on the amount of Peds up-ended by cyclists who ignore reds and footpaths and spending money on their education would produce a bigger fall in road death and Casualities. What about making cyclists take a cycle user course and make them have 3rd party insurance. Why cant these euro prats leave us alone whether we ride bikes or like myself a modified Lambretta 225cc 30 mil dellorto and fresco pipe, its my bike i’ll buy what I want when I want so there! I get sick of these idiots getting invovled in our scene’s had my rant now, ride safe ride proud. But the proposed legislation – which is still being discussed and has yet to be voted on in parliament – refers to new motorcycles. In any case, this will not affect old bikes, nor the aftermarket for spare parts for these bikes. Furthermore the proposals aim to focus on motorcycles up to the new 3DLD category of A2. There’s a lot of misinformation out there. I am outraged to hear of this new legislation , unfortunatly there are idiots out there who shouldn’t modify their bikes but there are a huge amount of people who do know what they are doing and who are considerate to others! As far as im concerned my bike has been modified quite a lot, IT NOW HAS BETTER BRAKES AND HANDLES BETTER than the standard bike, yes it does go better too and yes its still considerably quieter than your average Harley!! I have also had a huge amount of problems with a company that supplied me with a re-con engine that I have had to re-build myself, my point being if you can’t trust a propper garage to carry out work then you are forced to do it yourself! Also with older vehicles it can be hard to find original parts so a modification is often the only way to keep it on the road! My bike is 30 plus years old yet as I keep it in good mechanical order it does not smoke, use oil and it does nearly 70 mpg. So in my opinoin is no more polutant than a Toyota Prias hybrid thingy, yet my road tax is still £70 a year ish!! YOU CAN NOT TREAT EVERY ONE LIKE A MORON, a propper MOT test should be good enough to dictate wether a vehicle is safe to use or not , my bike passes every year! Fantastic letter, let us know if you get a response. PLEASE CAN YOU TELL ME WHEN A SIMILAR PROGRAM WILL BE INTRODUCED FOR CARS? IF CHANGES LIKE THIS WERE BEING CONSIDERED FOR CARS THERE WOULD HAVE BEEN POSTERS, ADVERTISING CAMPAIGNS ON TV AND NEWSPAPER AND MOTORING PRESS ARTICLES. WHERE IS THE PUBLIC NOTIFICATION? WE DON’T ALL SPEND OUT MONEY ON MOTORCYCLE MAGAZINES AND NEWSPAPERS. WHY DON’T YOU LOOK AT YOUR DATABASES AND CONTACT ‘EVERYONE’ WITH THE AFFECTED LICENCE GROUPS DIRECTLY AND ASK FOR INPUT INSTEAD OF HIDING BEHIND POORLY ADVERTISED AND BADLY THOUGHT OF WEBSITE COMPETITIONS? SCARED OF THE RESPONSE? PLEASE MAKE PUBLIC IMMEDIATELY THE STATISTICS YOU’VE USED TO START THIS STUDY OFF. PLEASE CLEARLY SHOW THE ACCIDENTS, POLLUTION (BOTH NOISE AND ATMOSPHERIC) CAUSED BY MOTORCYCLES. USE A SIMILAR CHART TO SHOW HOW YOU EXPECT TO IMPROVE THESE STATISTICS. PLEASE ALSO EXPLAIN WHEN SOMETHING WILL BE DONE ABOUT VEHICLES LEAKING OIL AND DIESEL ONTO THE ROADS WHICH KILLS MOTORCYCLISTS. PLEASE ALSO EXPLAIN WHEN METAL MANHOLE COVERS WILL BE MOVED FROM THE APEX OF CORNERS WHICH KILL MOTORCYCLISTS. PLEASE ALSO EXPLAIN WHEN PAINTED ROAD LINES WILL BE MADE LESS SLIPPERY SO THEY STOP KILLING MOTORCYCLISTS. PLEASE ALSO TELL ME WHEN THERE WILL BE AN ACTIVE PROGRAM TO ADDRESS ALL THE POTHOLES, POORLY MADE TARMAC JOINTS UP CENTRE LINES AND CRACKS IN THE ROAD SURFACES WHICH ALL KILL MOTORCYCLISTS WILL BE SORTED OUT. WHEN WILL YOU MAKE IT ILLEGAL FOR INEXPERIENCED UNQUALIFIED DRIVERS TO TEACH LEARNER DRIVERS ON PUBLIC ROADS – MOSTLY WITH NO INSURANCE BECAUSE OF THE COSTS?! RIDING A MOTORCYCLE REQUIRES A LOT MORE SKILL AND CONCENTRATION THAN DRIVING A CAR. THIS IS PROVEN QUITE CLEARLY BY ALL THE UNSAFE CAR DRIVERS ON THE ROADS… THEY CAUSE THE ACCIDENTS ON THE WHOLE, NOT THE MOTORCYCLISTS, NOT THE MOTORCYCLES, NOT THE MODIFICATIONS MADE TO THE MOTORCYCLES, IN FACT I CAN SITE CASES WHERE A NOISY EXHAUST HAS SAVED LIVES! RESTRICT LEARNER CAR DRIVERS AND NEWLY PASSED DRIVERS TO 1.0L ENGINES, MAKE IT ILLEGAL FOR THEM TO MAKE ANY MODIFICATIONS. MAKE NEW CAR DRIVERS TAKE A 2ND TEST BEFORE THEY ARE ALLOWED ON MOTORWAYS. MAKE THEM BE RETESTED TO GRADUATE ONTO LARGER MORE POWERFUL ENGINES. THE ISSUE HERE ISN’T MOTORCYCLE MODIFICATIONS, ITS BADLY TRAINED NEW DRIVERS WHO ARE TRAINED BY INEXPERIENCED DRIVING INSTRUCTORS. I SEE MANY DRIVING INSTRUCTORS ON BRITISH ROADS WHO I WOULD CHEERFULLY BAN FROM DRIVING. I SAW ONE YESTERDAY FROM RED DRIVING ON A MOTORWAY WITH HIS L PLATES ATTACHED AND A SATNAV MOUNTED AT EYE LEVEL IN FRONT OF HIS FACE… WHAT CHANCE DO NEW DRIVERS HAVE OF BEING TAUGHT CORRECTLY WITH INCOMPETENT DRIVING INSTRUCTORS!? No surprise but it looks like the Commission and TRL don’t act on what they write. In the TRL study (L Category Vehicles: Powertrain tampering prevention and Durability) L4e vehicles are excluded. We said, “So it appears that by implication these vehicles are not considered a problem (in fact in terms of safety the frequency of motorcycle sidecar casualties are rare). The competition now includes L4e: Two-wheel motorcycle with side­car. However they suspect that harmful tampering on this particular vehicle category is insignificant and negligible in comparison to harmful tampering on mopeds, light motorcycles or quads. So has anybody seen the goalposts that have been moved? The Motorcycle Action Group (MAG UK) has posted a message out today regarding the European Commission (EC) and TRL (Transport Research Laboratory) competition. At Right To Ride we are long enough in the tooth to realise that some work done with the powers that be cannot be reported right away until finalised or a strategy finalised before being acted on. Which makes us think that with the deathly silence, until MAG spoke out, from riders representatives in Europe that plans are afoot. Well we can only hope that this is not wishful thinking! If you follow the link below, you could win 500 Euros. This is not because your Nigerian Uncle has just died, but rather because Transport Research Laboratory is offering the public cash prizes, for ideas. adverse effect for safety or the environment. If you click here http://l-cat.trl.co.uk/index.php/tampering-competition/ you’ll see that Transport Research Laboratory is asking the public for ideas as to how to implement anti-tampering.